Joshua is convinced there is a family curse. It’s taken loved ones from him, it’s robbed him of his eyesight, and it’s the reason why his detective father is killed while investigating the homicide of a young woman. 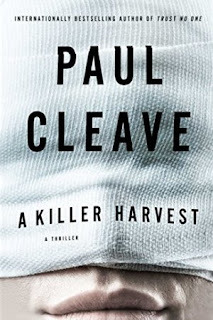 I fear I'm sounding like a broken record when it comes to Paul Cleave's thrillers - book after book he shows himself to be one of the world's finest authors when it comes to creating page-turners with real depth that dance along the darker edge of the crime and thriller genre. His tenth novel is something of a departure: there's a teenage protagonist (but this is very much an adult thriller with a teen hero, rather than a young adult novel), and Cleave veers towards his horror roots with the inclusion of an eye transplant and the idea of 'cellular memory', where an organ recipient feels that they've inherited memories or feelings from the donor. Long-time Cleave fans shouldn't worry though - these aspects just add fascination to his tale, rather than overwhelming it. If Cleave was a literary author - particularly one from Latin America - A Killer Harvest might be considered 'magic realism'; a story with a single fantastical element intertwined in a rich portrayal of an otherwise very realistic, grounded world. As Cleave showed with his previous novel, the superb psychological thriller Trust No One, he's not afraid to stretch his literary legs within the crime genre. Despite its slightly experimental feel, A Killer Harvest is still one of those thrillers that you can absolutely tear through in one sitting, while never feeling like it's 'thin' or 'breezy'. It's a terrific read, darkly hypnotic, that entices you through the power of Cleave's characterisation and storytelling even more so than its high-concept hook. As we've come to expect from Cleave, there's a delicious malevolence, tempered by his trademark obsidian humour and prose that crackles like a campfire. The narrative switches between teenager Joshua, struggling with the tragedy and opportunity surrounding his new eyesight, and several other characters. Cleave masterfully builds the tension as we shift perspectives; A Killer Harvest dances along assuredly through all the movements. At its heart, A Killer Harvest is a tale of an isolated boy struggling to fit in, who now feels like 'a freak' in both the blind world and the sighted one. Who's faced tragedy from his earliest days, and must find something deep within himself as the sins of the father threaten to be visited upon the son. 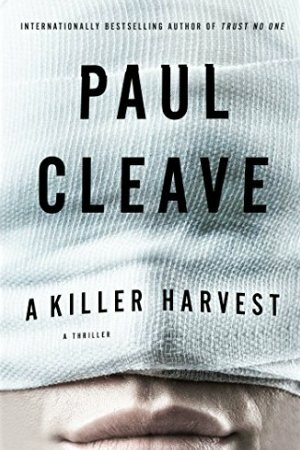 Overall, A Killer Harvest is a superb read from a virtuoso of the darker edge of crime that is firmly in the mix for my 'best read of the year'. Very highly recommended.